Asahi has constructed a slow-motion video booth which lets beer drinkers experience what it's like to be inside a pint, including firing 100 ping-pong balls at them in imitation of foam. The Japanese lager is claiming a world first with its ‘Asahi Slow-Mo Booth’, which also lets up to four people capture their best moments in cinematic slow motion. 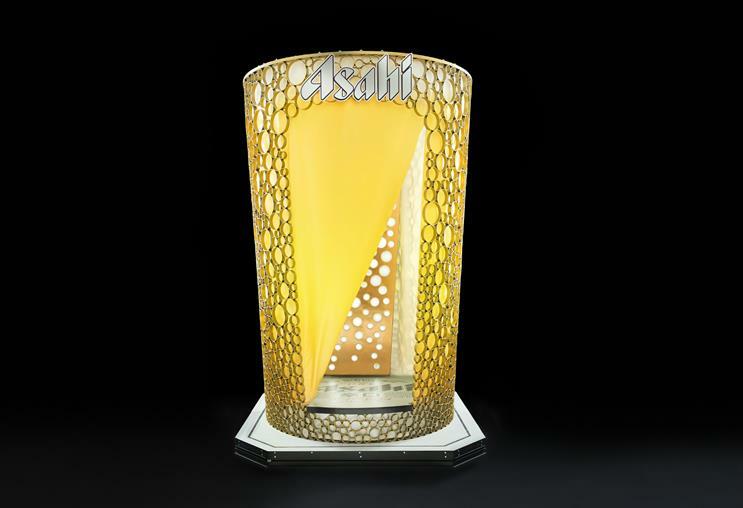 The booth is three metres high and in the shape of an Asahi pint glass. Video from the booth is then sent to guests so they can post it on Facebook, Instagram, Twitter using the #AsahiSlowMo hashtag. There is a range of special physical effects build into the booth to make each person feel like they are inside a pint of Asahi. These include a jet of malt-infused condensation mimicking the experience of being inside pint glass and the ping-pong balls, which are launched from a secret trap door in imitation of beer bubbles. "We wanted to create an experience that’s fun, exciting, shareable but also one that conveys the crisp and refreshing qualities of Asahi Super Dry," said Asahi UK brand manager Samantha Catford. "The result is a world-first: a branded super slow-mo booth which takes the photo booth concept to the next level while linking to the brand’s unique qualities and reputation for innovation." The booth is now beginning a UK tour visiting some of the nation’s top venues and events.